Baby boomers and Generation X that follows them are now in range of retirement, and books about aging and the post-work life are proliferating. Most are really depressing. They tell us how much money we’ll need (lots!) when we are at an age where increasing income or wealth is not easy. They tell us what we need to do to keep our health (diet and exercise) and then scare us by saying we should have started decades ago. They paint a future for us where our biggest concern will be to tack down scatter rugs so we won’t fall and thus immobilize ourselves for the rest of our lives. This is why a newly released book is to be celebrated. 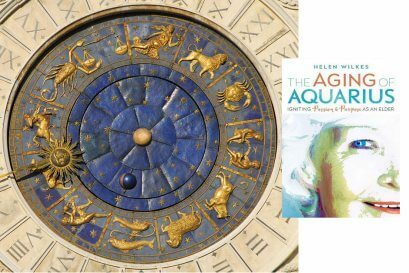 The title, The Aging of Aquarius: Igniting Passion and Purpose as an Elder, promises an optimistic and positive spin on our later years and the content of the book delivers. The author, Helen Wilkes, is an example of how to live long, well and happy. One would not have guessed this from her background: a childhood in war-torn Europe, fleeing to Canada where her immigrant parents never truly integrated into Canadian society and a marriage that did not last. Now, Wilkes has been retired for over 20 years and is over eighty years old. She declares that these are the best years of her life. Her book outlines how we, too, can make our after-work years a celebration. First there is the focus that retirement, like graduation, should not be seen as an ending of our active and useful life, but a commencement of new and often better opportunities to be active and useful. And active and useful we must be. Retirement is more than just aging and keeping busy. Tidying the garden, redecorating and organizing the family pictures will only get us so far. To find and exercise our purpose takes courage and effort. Courage is required to get out of our comfort zone and try something new and different and often scary. We could follow Helen’s example and write a book or two or become active in a good cause. Perhaps we always wanted to paint, learn a musical instrument or take courses in an area very different from what we had previously studied and/or worked in. All of these things inherently include the possibility of failure; hence the courage to face that risk. None of these are easy or quick; hence the effort. Self-regard comes from recognizing our own successes, large or small and not depending on the opinions of others whose expectations we may never meet. We can pass on the lessons that a long life has taught us. This same experience is also what enables us to take control of our own affairs even when that is calling for others to help when we are wise enough to realize that there are problems we cannot solve on our own. Strong social ties make a contribution to well-being that is right up there with diet and exercise. This book is peppered with examples of how family, friends, community groups and even strangers add richness to our lives and help us find and achieve our purpose. Little snippets of good advice pop up unexpectedly throughout the book, such as Helen’s motto: ‘When in doubt, say yes’ or ‘Whatever we pay attention to becomes stronger,’ or the idea of turning a situation on its head. For example, if you could use a word of comfort and there is no one to give it to you, find someone else who needs comfort and talk to them. At the end of every very readable and short chapter of this book there are useful ideas and positive actions you can take so that your post-work years can be the best years of your life. If you would like to see them for yourself, click helenwilkes.ca.